Dunham does a wonderful job of including so much of the human interest angle into Boston, infusing it with grit and heart. His presentation and delivery hold the viewer’s attention even if they are a novice to the world of running and Marathons. "Boston Strong" - the phrase has come to symbolize a feeling of hope and community surrounding a horrible tragedy and a horrific act of terrorism on American soil. The 2013 event shone a spotlight on the City of Boston and the Boston Athletic Association and has sparked two major motion pictures. It also prompted director Jon Dunham (Spirit of the Marathon) to focus on the history of the Boston Marathon and the 2013 race. In Boston, he highlights not only the race but the city itself and gives the audience an insight and a unique perspective on the event. 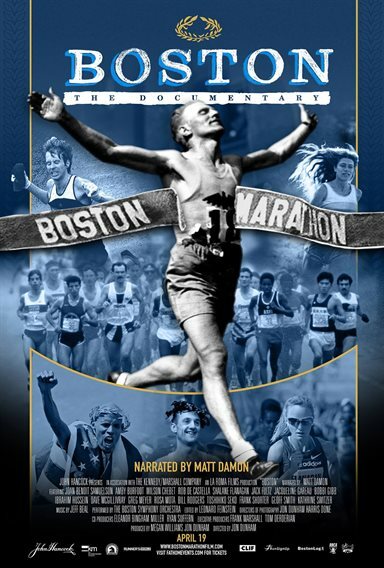 Narrated by Matt Damon (Good Will Hunting), Boston begins its almost two-hour journey discussing the history of the Boston Marathon tracing all the way back to its beginnings and ties to the games in Ancient Greece and the first modern Olympic games. Held on the third Monday in April (known as Patriots Day), the first event was held 120 years ago in 1897 with fifteen runners. It is the World's oldest annual marathon and is one of the best-known road races. It currently stands at over 37,000 runners per year and is one of the most sought after entrance invitations in the world. When the film starts, we get some of the history of the Marathon and movie into the 1930's and some of the winners. It then fast forwards to the 1960's and 70's with interviews from such winners as Jon Anderson and Bill Rogers. The film touches upon one-time winner Australian winner Robert de Castella who brought his notoriety back to his homeland and started a running program for the indigenous people. Moving on, the movie highlights some of the more controversial years in the marathon's history. It delves into the first year prize money was awarded in response to other marathons offering cash awards. The Boston Marathon held out for as long as it could after awards were instituted but the movie documents how the most elite runners boycotted Boston until they too gave in and gave cash prizes to the winners. The film also highlights the first female participants in the race both sanctioned and unsanctioned. It highlights Bobbi Gibbs and interviews who entered the race in 1966 even though women weren't allowed and how she paved the way for those women who came after her once the Marathon officially began allowing women runners in 1972. It touches upon the Rosie Ruiz scandal of 1980 as well, when Ruiz won the marathon by cheating and entering the race at the last 2 miles. Of course, the movie spends a significant amount of time on the 2013 bombing and its aftermath. Boston chronicles the events leading up to the bombing and the twelve months following the event ending with the 2014 race. It shows a city and the surrounding suburbs that rallied behind their beloved event and the courage shown not only for the runners but the spectators as well. Boston Strong came back stronger and more determined as ever to let the terrorists know they hadn't beaten us. Through it all, Damon's voice is distinct and soothing, with a deep and clear message. For those of us that aren't runners and know extremely little about marathons or for those who aren't from the Boston area, this film will shed light on how much more important the Boston race is on the world stage; even more perhaps than the New York City Marathon. Dunham does a wonderful job of including so much of the human interest angle into Boston, infusing it with grit and heart. His presentation and delivery hold the viewer's attention even if they are a novice to the world of running and Marathons. It's an enjoyable watching experience and a lesson in logistics, perseverance, and endurance. Download Boston from the iTunes Store in Digial HD. For more information about Boston visit the FlickDirect Movie Database.